1. any dye, reagent, or other material used in producing coloration, such as a substance used in coloring tissues or microorganisms for microscopical study. For specific stains, see Stains and Staining Methods below. 2. a superficial discoloration, or an artificially colored spot in the skin. acid stain, one that is acid in reaction and more readily colors the protoplasm of cells. acid-fast stain, a staining procedure for demonstrating acid-fast microorganisms; see auramine-rhodamine s., Fite method, Kinyoun staining method and Ziehl-Neelsen staining method at Stains and Staining Methods. basic stain, one that is basic in reaction and shows an affinity for the nuclei of cells. contrast stain, material used to color an unstained portion of a tissue after another portion has been stained with another dye. differential stain, one that aids differentiation of various elements in a specimen. electron stains, substances containing heavy atoms, such as osmic tetroxide, uranyl, and lead ions, which, under certain conditions, act as “electron stains,” comparable to histologic stains, by combining selectively with certain regions of the specimen; used in the visualization of the ultrastructure. extrinsic stain, a stain that can be removed from a tooth surface by polishing. heavy metal stain, any of the elements of high atomic weight often used as stains in electron microscopy. intrinsic stain, a stain that is within the enamel of a tooth and cannot be removed by polishing. lipoid stain, one made from a lipid or fatlike substance, such as Sudan III. metachromatic stain, one that colors certain cell constituents a color different from that of the stain itself. neutral stain, a compound that combines an acid dye and a basic dye, the cation and anion of the resulting salt each having a different color. nuclear stain, one that has a special affinity for the nuclei of cells. plasmatic stain, plasmic stain, one that colors the tissue uniformly throughout. port-wine stain, a persistent dark red to purple nevus flammeus, usually on the face, growing proportionately with the affected child. At first it is macular, but it may later develop angiomatous overgrowths. 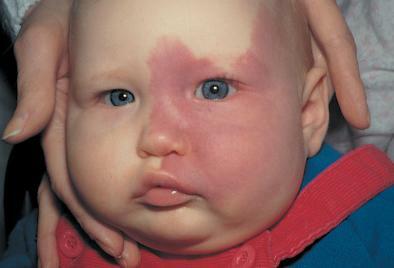 Port-wine stains often occur in association with other congenital abnormalities, such as the Klippel-Trénaunay and Sturge-Weber syndromes. Called also port-wine mark or nevus. protoplasmic stain, one that has a special affinity for the protoplasm of cells. selective stain, one that has a special affinity for a certain tissue element, staining it more vividly than, or to the exclusion of, other elements of the same specimen. thiazine-eosinate stain, any of a group of neutral stains used in hematology and histology that combine an eosin dye, usually eosin Y, as the anionic component and one or more thiazine dyes as the cationic component. The prototype is the Romanowsky stain. tumor stain, an area of increased density in a radiograph due to collection of contrast material in distorted and abnormal vessels, prominent in the capillary and venous phases of arteriography, and presumed to indicate neoplasm. Listing some of the preparations and methods commonly employed in histologic and pathologic technique (arranged alphabetically). For other stains, see under blue, red, etc. acid fuchsin stain, a diffuse stain containing acid fuchsin and diluted hydrochloric acid in purified water, for demonstrating axons and as a component of connective tissue stains. Albert diphtheria stain, a stain containing toluidine blue and methyl (or malachite) green. Following treatment with iodine solution, the metachromatic granules appear black, the bars dark green to black, and the remainder of the diphtheria bacillus a light green. alum-carmine stain, a preparation of ordinary alum and carmine. Alzheimer stain, a methylene blue and eosin polychrome stain for demonstrating Negri bodies. Anthony capsule stain, a method of demonstrating the capsules of bacteria. A smear of a milk culture is air dried, or a smear is mixed with milk and dried. The slide is stained with crystal violet and washed with copper sulfate. The capsule appears unstained against a purple background; the cells are deeply stained. auramine-rhodamine stain, Truant auramine-rhodamine s.
azan stain, Heidenhain's modification of Mallory triple stain. Benda stain, a method for demonstrating nerve tissue. Best carmine stain, a stain for demonstrating glycogen. Bethe method, a method of fixing methylene blue stains of nerve fibers. Bielschowsky method, a method for demonstrating axons and neurofibrils using an ammoniacal silver stain. Bodian method, a method of staining nerve fibers and nerve endings with colloidal silver. Bowie stain, a stain used to demonstrate the slightly basophilic cytoplasm and the specific granules of juxtaglomerular cells. Cajal method, a method of staining astrocytes by a gold chloride–mercuric chloride compound. Cajal double method, a method of demonstrating ganglion cells. carbolfuchsin stain, carbolfuchsin used in a stain, particularly for detection of acid-fast bacteria; see Kinyoun staining method, Ziehl-Neelsen staining method, and Fite method. It is also used as a counterstain for Legionella pneumophila following other routine stains. Stained cells appear pink to red. carbol–gentian violet stain, a solution containing gentian violet and phenol (carbolic acid). Castaneda stain, a method of demonstrating rickettsiae. A smear is air dried and treated with methylene blue, then counterstained with safranin O, washed, and air dried. Rickettsiae appear blue against red cellular elements. Ciaccio stain, a stain for demonstrating lipids. Davenport stain, a stain for demonstrating various elements of nerve tissue, dependent upon the special affinity of nerve cells and their processes for silver. Delafield hematoxylin stain, a preparation of hematoxylin, alcohol, ammonia alum, water, glycerin, and methanol, used as a nuclear stain. Dieterle stain, a silver impregnation method for staining Legionella and other organisms. Slides are sensitized in uranyl nitrate, treated with gum mastic, incubated in silver nitrate, and developed in a solution of hydroquinone, sodium sulfite, acetone, formaldehyde, pyridine, and gum mastic. Cells stain black on a yellow-tan background. Ehrlich acid hematoxylin stain, a preparation of hematoxylin, used as a nuclear stain. Ehrlich triacid stain, a stain containing acid fuchsin, orange G, and methyl green; used for demonstrating various formed elements in the blood. F method, chromosomes are treated with phosphate buffer, rinsed and stored for 60–72 hours in saline citrate solution, then fixed in methanol-acetic acid, and stained by the Feulgen method. Feulgen method, a method of demonstrating chromatin and deoxyribonucleic acid (DNA). Fite method, a staining method used for acid-fast microorganisms. Tissue sections are deparaffinized in 2:1 xylene and peanut oil, then stained with Ziehl-Neelsen carbolfuchsin, decolorized with acid alcohol, and counterstained with methylene blue. Fontana stain, a method of staining spirochetes by silver impregnation, using ammoniacal silver nitrate solution. Fontana-Masson stain, an ammoniacal silver nitrate stain for melanin and argentaffin material; used in the diagnosis of melanoma, pheochromocytoma, and carcinoid tumors. Giemsa stain, a solution containing azure II-eosin, azure II, glycerin, and methanol; used for staining protozoan parasites such as Plasmodium and Trypanosoma, for chlamydiae, for differential staining of blood smears, and for viral inclusion bodies. Stained elements appear pink to purple to blue. 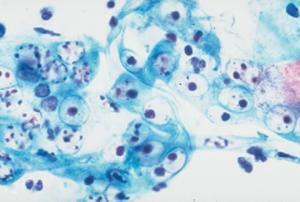 Gimenez stain, a method for staining chlamydiae, rickettsiae, and Legionella. Smears are stained with carbol–basic fuchsin solution, washed, and counterstained with malachite green. Cells appear red against a greenish background. Golgi stain, any of several stains that were widely used for staining nerve cells and their processes. Golgi-Cox stain, a modification of one of Golgi's original methods, used for staining ganglion cells. Gomori stains, stains used for histological demonstration of enzymes, especially phosphatases and lipases in sections; also methods for demonstration of connective tissue fibers and secretion granules. Gomori methenamine silver (GMS) stain, methenamine silver s.
Gomori trichrome stain, a one-step mixture of stains used to identify an increase in collagenous connective tissue fibers or to differentiate between collagen and smooth muscle fibers; it combines a plasma stain (chromotrope 2R) and a connective tissue fiber stain (fast green FCF, light green, or aniline blue), with phosphotungstic acid, and acetic acid. The mixture differentially stains a variety of cytoplasmic inclusions associated with various disease states, such as ragged red fibers. Gomori-Wheatley stain, a rapid type of trichrome stain for demonstrating structural details of intestinal protozoa. The solution is as follows: chromotrope 2R 0.6 g, light green SF 0.3 g, phosphotungstic acid 0.7 g, acetic acid 1.00 mL, and distilled water 100.00 mL. Goodpasture stain, a method for demonstrating the peroxidase reaction. Gram method, Gram stain, an empirical staining procedure in which microorganisms are stained with crystal violet, treated with 1:15 dilution of strong iodine solution, decolorized with ethanol or ethanol-acetone, and counterstained with a contrasting dye, usually safranin O. Those microorganisms that retain the crystal violet stain are said to be gram-positive, and those that lose the crystal violet stain by decolorization but stain with the counterstain are said to be gram-negative. Gram-positive organisms that lose the stain easily, so that samples appear to be a mixture of gram-positive and gram-negative organisms, are said to be gram-variable. Grimelius argyrophil method, a method for demonstrating granule-containing cells such as APUD cells. Incubation in a buffered silver nitrate solution is followed by reduction in a hydroquinone and sodium sulfite solution; reactive cell granules appear black. Grocott-Gomori methenamine–silver nitrate stain, a method for demonstrating actinomycetes and fungi in tissue. Sections are treated with chromic acid, stained with methenamine-silver nitrite solution, and counterstained with light green solution. Cells appear brown against a green background. Hale iron stain, a stain used on substances with a high acid polysaccharide content because of the ability of polyanionic polysaccharides to bind polyvalent cations. Its main component is colloidal iron (Fe3+). Hansel stain, one used to detect eosinophils in urine or other body fluids, the eosinophils staining red against a background of blue. Harris hematoxylin stain, a nuclear stain containing hematoxylin, aluminum sulfate, mercuric oxide, and alcohol in water; modified preparations lacking the mercuric oxide also exist. Heidenhain iron hematoxylin stain, an important cytological method for the demonstration of most cellular structures: nuclei, chromosomes, centrioles, fibrils, mitochondria, cilia, etc. hemalum stain, a nuclear stain containing hematoxylin and alum, widely used, especially in combination with eosin. hematoxylin-eosin stain, a mixture of hematoxylin in distilled water and aqueous eosin, usually eosin Y, solution, widely employed for routine examination of tissues; numerous variations are employed in execution of the stain. hematoxylin-eosin-azure II stain, a method for the staining of blood-forming organs; called also Maximow method. Hiss capsule stain, a method of demonstrating bacterial capsules. Smears are treated with crystal violet, heated, and rinsed with copper sulfate solution. Capsules appear as pale blue halos around deep blue to purple cells. Hortega method, a method of demonstrating microglia, employing ammoniacal silver carbonate. 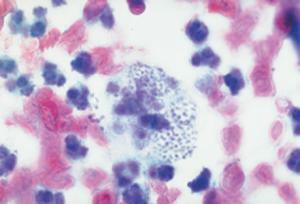 India ink capsule stain, a method of demonstrating cell capsules, especially of Cryptococcus neoformans. The smear is mixed with India ink, covered with a coverglass, and examined microscopically. Capsules appear as a clear halo around the cells against a black background. iron hematoxylin method, a staining procedure in which the sections are treated with an iron salt, stained with hematoxylin, and differentiated with the same iron salt. Jenner method, a method for demonstrating blood corpuscles. Kinyoun staining method, a stain for acid-fast organisms that does not require heating the stained slides. A heat-fixed smear is treated with Kinyoun carbolfuchsin. The slide is washed with water, decolorized with acid alcohol, and counterstained with methylene blue. Acid-fast organisms appear red against a blue background. Cf. Ziehl-Neelsen staining method. Leifson flagella stain, a method for demonstrating bacterial flagella. Smears are air dried, treated with alcoholic pararosaniline–tannic acid solution, and washed. Flagella are visible against a clear background. Leishman stain, a mixture of alkaline methylene blue and eosin in methanol for staining blood cells and certain parasites; also used for G banding of chromosomes. Levaditi method, a method for demonstrating Treponema pallidum in sections, employing reduced silver. lithium-carmine stain, a diffuse stain used intravitally for the demonstration of macrophages. Löffler alkaline methylene blue stain, a simple stain used especially for demonstrating granules in Corynebacterium diphtheriae. Methylene blue made alkaline with potassium hydroxide is applied to a smear briefly and the slide washed. Granules appear deep blue in lighter blue cells. Lugol iodine stain, strong iodine solution. Luxol fast blue stain, trademark for a group of dyes used in histology as stains for complex lipids, particularly myelin; they have a marked affinity for phospholipids, lecithin, and cephalin. Macchiavello stain, a stain used for chlamydiae. The heat-fixed smear is stained with basic fuchsin, decolorized in citric acid, and counterstained with methylene blue. Organisms stain red against a blue background. Mallory acid fuchsin, orange G, and aniline blue stain, a stain for demonstrating connective tissue and secretion granules. Called also Mallory triple s.
Mallory phloxine–methylene blue stain, a stain used in histology to demonstrate connective tissue. Mallory phosphotungstic acid–hematoxylin stain, a stain used for demonstrating nuclear and cytoplasmic detail and connective tissue fibers. Mallory triple stain, Mallory acid fuchsin, orange G, and aniline blue s.
Marchi method, a method of demonstrating degenerated nerve fibers, the tissue first being fixed in a solution containing potassium bichromate, which prevents the normal myelinated fibers from staining with osmic acid. Masson stain, Masson trichrome stain, a trichrome stain for tissue including pituitary, thyroid, nerve, epithelial, and connective tissue. May-Grünwald stain, an alcoholic neutral mixture of methylene blue and eosin. Mayer hemalum stain, an aqueous solution of hematein, alum, thymol, and 90 per cent alcohol. Mayer mucihematein stain, a specific stain for mucin. methenamine silver stain, (for argentaffin cells) a methenamine silver solution used together with gold chloride, sodium thiosulfate, and a safranin O counterstain; argentaffin granules are black while granules of mast cells remain red. (for fungi)Grocott-Gomori methenamine–silver nitrate s.
methyl green–pyronin stain, a solution of methyl green and pyronin (usually pyronin Y) used as a differential stain for DNA and RNA: DNA is stained blue-green by methyl green and RNA is stained red by pyronin. Milligan trichrome stain, a differential stain for connective tissue and smooth muscle. Nuclei and muscle appear magenta; collagen appears green or blue, depending on whether fast green or aniline blue is used as a counterstain; and red blood cells appear orange to orange red. Nissl method, a method employed in the study of nerve cell bodies. Pal-Weigert method, a modification of the Weigert myelin sheath method used in the study of myelinated nerves; the specimen being treated is immersed for several weeks in a solution containing potassium bichromate. Papanicolaou stain, a method of staining smears of secretions from the respiratory, digestive, or genitourinary tract for examination of exfoliated cells, to detect the presence of a malignant process; used in the Papanicolaou test (see under test). Pappenheim stain, the original methyl green–pyronin staining method, used to differentiate between basophilic granules of erythrocytes and nuclear fragments. PAS stain, periodic acid?Schiff stain, see under reaction. Perls stain, see under test. phosphotungstic acid–hematoxylin stain, see Mallory phosphotungstic acid–hematoxylin s.
Q method, Q banding method, quinacrine fluorescent method, see under banding. R method, see under banding. Ranson pyridine silver stain, a stain used for demonstrating nerve cells and their processes. R banding method, see under banding. resorcin-fuchsin stain, Weigert resorcin-fuchsin s.
reverse Giemsa method, R banding. Romanowsky (Romanovsky) stain, the prototype of the many eosin–polychrome methylene blue stains for blood smears and malarial parasites, including Giemsa stain, Leishman stain, and Wright stain. Seller stain, a combination of alcoholic solutions of methylene blue and basic fuchsin which stains Negri bodies a bright red against a purplish-pink background; used in rapid diagnosis of rabies. Steiner stain, a staining method for detecting spirochetes and nonfilamentous bacteria in paraffin-embedded tissue by first sensitizing it to silver and then exposing it to silver nitrate. Sternheimer-Malbin stain, a stain used in urinalysis which has ready affinity for hyaline casts, epithelial casts, red cells, bladder epithelial nuclei, nuclei of vaginal epithelium, and trichomonads, staining each a different color. Sudan black B fat stain, a stain used to demonstrate Legionella and fat vacuoles in bacterial cells. A heat-fixed smear is treated with Sudan black B, cleared with xylol, and counterstained with safranin. Fat vacuoles stain blue-black; bacterial cells stain pink. T method, a method for staining only the terminal ends of chromosomes by means of either Giemsa stain or acridine orange; it results in bands (T bands) of dark violet (Giemsa) or fiery orange (acridine orange). tetrachrome stain, a stain combining eosin Y, methylene blue, azur A, and methylene violet, in methyl alcohol. trichrome stain, any staining method having three dyes of different colors, usually with the sample being exposed sequentially, such as the Gomori or Masson trichrome stains. Truant auramine-rhodamine stain, a method for demonstrating mycobacteria. A smear is heat fixed, stained with auramine-rhodamine solution, decolorized, counterstained with potassium permanganate, and examined under ultraviolet light; acid-fast organisms glow with a yellow-orange color. Unna-Pappenheim stain, a variation of methyl green–pyronin stain, used to detect plasma cells and demonstrate nucleoproteins. van Gieson stain, any of several staining solutions formerly widely used for connective tissue samples. Verhoeff stain, a type of iron hematoxylin staining method for demonstrating elastic tissue. Verhoeff-van Gieson stain, a histopathological stain for demonstrating elastic fibers. von Kossa stain, a silver nitrate stain for bone mineral. Warthin-Starry silver stain, a method for staining Bartonella and spirochetes. A smear is air-dried, immersed in absolute ethanol, washed in distilled water, and incubated in 2 per cent silver nitrate. The cover glass is then developed in a mixture of silver nitrate, gelatin, glycerol, agar, and hydroquinone. Organisms appear black on a light background. Wayson stain, a method used to demonstrate polar staining. A smear is treated with a mixture of basic fuchsin and methylene blue with phenol, washed with water, and dried. It is used especially to demonstrate Yersinia pestis in specimens from tissues and lymph nodes. Weigert fibrin stain, a method, many variations of which have been used in both fixation and staining; stains gram-positive bacteria as well as fibrin. Weigert iron hematoxylin stain, a simple method for staining most nuclear and cytoplasmic constituents. Weigert myelin sheath method, a method of demonstrating the myelin sheath of nerve cell processes. Weigert neuroglia fiber stain, a complicated method for demonstrating fibrous glia, which works best on human material. Weigert resorcin-fuchsin stain, a method for the demonstration of elastic fibers. Weil stain, a method for staining myelin sheaths. Wirtz-Conklin spore stain, a smear is heated with malachite green, rinsed, then counterstained with safranin. Spores appear green in red-stained cells. Wright stain, a mixture of eosin Y and polychrome methylene blue, used for staining blood smears and for detection of malarial parasites in the blood. Ziehl-Neelsen staining method, a stain for acid-fast organisms. A heat-fixed smear is flooded with Ziehl-Neelsen carbolfuchsin, heated for 5 minutes, cooled, and washed. The slide is decolorized with acid alcohol, washed, and counterstained with methylene blue. Acid-fast organisms appear red against a blue background. Cf. Kinyoun staining method. Papanicolaou stain of basophilic intranuclear inclusions in adenovirus infection. Papanicolaou stain of macrophage containing Donovan bodies. 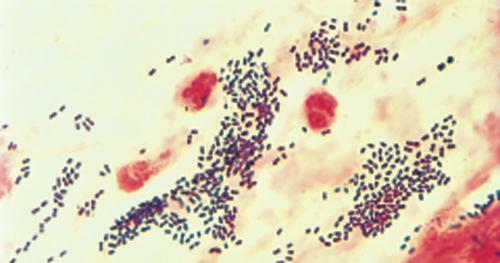 Gram stain demonstrating gram-positive diplococci in sputum smear.